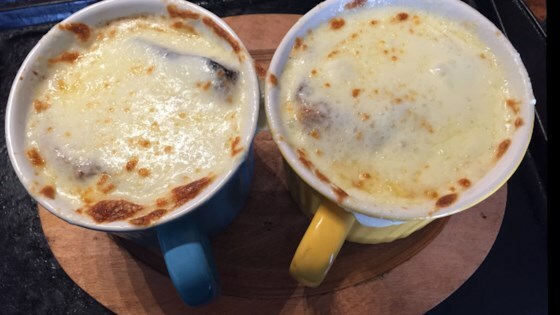 "An absolutely delicious French onion soup. Season with soy sauce instead of salt and top with your favorite cheese and melt it under the broiler, if desired." In a large, heavy stockpot over medium heat, cook sherry until bubbling. Add the onions, and reduce heat to medium. Cook onions slowly, stirring frequently, for at least 20 minutes, until they begin to form a paste. Stir in the garlic and continue to cook for 5 to 10 minutes, until garlic begins to look brown. Stir in flour and cook for 2 minutes. Pour in broth and bring to a boil. Reduce heat and simmer for 20 minutes. Season with pepper and salt. Ladle soup into bowls, and float a slice of toasted bread on top of each serving. This soup was extremely "onion-y". If I make it again, I would cut down on the onions and increase the broth.